Bump 'n' Jump is a driving game that supports the Expansion Module #2 steering wheel. 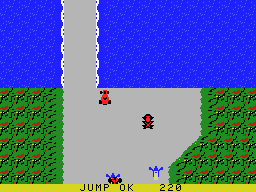 There's 20 levels (split into seasons) that involve manoeuvring your car through tight lanes, while avoiding obstacles and jumping over water hazards. Enemies litter the road to try and slow you down, but giving them a slight nudge crashes them into the scenery and scores you points! Once you reach the end of the track you refuel and move onto the next level. The controls offer razor-sharp accuracy and the steering wheel in particular ups the fun-factor and immersion to a huge degree; it's perfect for making small movements, as well as harsh turns where you spin the wheel with force to avoid crashing. Being able to steer in the air is a brilliant mechanic too that allows you to choose a different path and racing line, depending on what's ahead. Jumping has a great risk-reward element, as it's ridiculously satisfying when you smash down on an enemy from above, yet you chance wrecking if a hazard suddenly appears while you're airborne; this provides much-needed strategy to the seemingly basic gameplay. Similarly, bumping cars into walls is fiendishly enjoyable (especially when you pinball one car into another, forcing a chain reaction! ), but another option for experts is to completely avoid totalling enemies in a level to earn a massive 50,000 point bonus; it's challenging and almost acts like a retro style 'achievement' task! The collision detection is superb and the unlimited continues are a great idea so patient gamers can see later levels. My only real criticisms are that there's no visual aide to show how far along the level you are, and the seasonal themes aren't really reflected in the stage design. Bump 'n' Jump is a remarkably playable driving game and it's just as good of a showcase for the Expansion Module #2 as Turbo (1982, Colecovision). The ability to become airborne is where much of the stress and excitement comes from, and this gamble is an addictive hook that constantly keeps you on the edge of your seat. Random trivia: The game first launched in the Arcades in 1982, and was also ported to the Atari 2600 (1983) and Intellivision (1983).